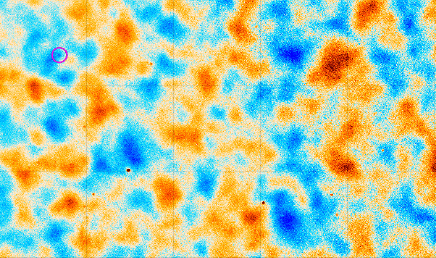 A 5×3 degree patch of the CMB as measured by the the Atacama Cosmology Telescope (image taken from Fig. 5 of Louis et al., 2017). Long before stars or galaxies had formed, the Universe was a hot, dense gas that glowed at a few thousand degrees. Today, we can observe the light from this primordial glow, called the cosmic microwave background (CMB) radiation. Since it has come to us through a Universe that has expanded in size by a factor of over a thousand, the wavelength of the light has been stretched from the visible part of the spectrum to the microwave—on the order of millimetres. Observations of the CMB over the past two decades have provided solid support for the Big Bang theory while also yielding a surprising amount of information about the early Universe and about the make-up of the Universe on its largest scales. On small scales, the CMB not only bears a record of the early Universe, but also of the more recent Universe, since its light has passed through clusters of galaxies and other large structures which leave their own distinctive imprints on the primordial signal. 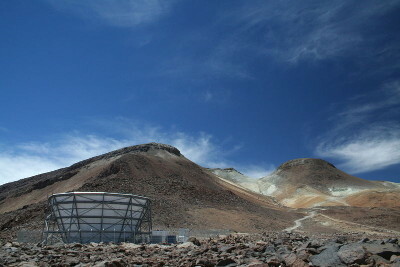 The Atacama Cosmology Telescope (ACT) is a six-metre telescope on Cerro Toco, in the mountainous desert of northern Chile, dedicated to making high-resolution measurements of the CMB. Though my contributions to ACT are currently minimal, I have at times been heavily involved in the project from near the inception of the project. Observations with ACT began in 2007, with major instrument upgrades taking place in 2013 and 2016. With our observations, we have made precise and detailed maps of the CMB that have contributed to tightening the precision on many of the fundamental parameters that characterise the Universe, such as the running of the spectral index, the number of neutrinos and the amount of primordial helium, and have placed constraints on the state of the very early Universe. We were the first group to detect gravitational lensing of the CMB by intervening cosmic structure, to provide evidence for dark energy using only the CMB, and are continuing to provide important lensing results. We were also the first statistically to measure the motion of galaxy clusters relative to the expansion of the Universe via the kinematic Sunyaev-Zeldovich effect. We have detected many clusters of galaxies (including a remarkably huge one) and done numerous follow-up studies of their properties. We have measured the microwave brightnesses of distant point sources and determined some of their important statistical properties. Articles about El Gordo in the popular press: BBC, CBC, NPR. Much of my current research energy is devoted to the Simons Observatory (SO), a new CMB project that brings together the ACT and Simons Array collaborations. We are planning one building several new telescopes at the same location in the Atacama: one large telescope, similar in size to ACT, and a few smaller telescopes. This collection of telescopes, which together comprise the SO, will significantly increase sensitivity to CMB measurements compared to current efforts. Probing the physics of the early Universe to test theories about the Big Bang. Better constraining how the Universe is expanding. Contributing to our knowledge of how galaxies form. Measuring the total mass of neutrinos, a fundamental but elusive particle in the make-up of the Universe. Currently I am most involved in developing the software that will allow us to record, view and process the large volumes of data that the telescopes will record. The Eternal Sky: A short documentary about the Simons Observatory. Page last edited at 00:27 UTC on 30 October 2018, A.D.